School books aren't for studying, you know. They're for drawing goofy pictures in. Because that certainly makes class time fly by. 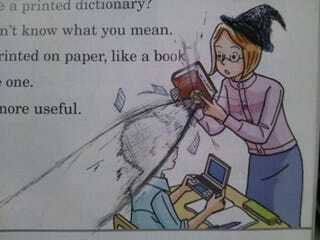 Previously, Kotaku introduced some of Japan's wonderfully wacky schoolbook doodles. Sometimes, people draw over existing images or fill in what's missing, while other times they go as far as erasing the original image to complete their amusing tableau. Be warned that, as with many doodles, there is some immaturity! But, really, that's the point, no?